NEW ZEALAND Three-Year-Old Pacer Of The Year; New Zealand Four-Year-Old Pacer Of The Year; New Zealand’s fastest pacer over 1950 and 2200 metres; four Group One wins…. By an eight-time New Zealand Stallion of the Year from a mare destined to be New Zealand’s Broodmare of the Year – Ultimate Machete has a stallion’s résumé and a stallion’s pedigree. Recently purchased by Alabar and Nevele R studs to stand at Alabar’s Auckland property, he’s also going to have a stallion’s opportunity. New Zealand and Australian racing is dominated by horses which thrive on today’s style of racing. Horses that are able to roll forward into the race and then be unrelenting in last halves run in 54 seconds or better. These qualities should come as no surprise as he is by Bettor’s Delight out of a mare by Armbro Operative, so bred three-by-three to Cam Fella. 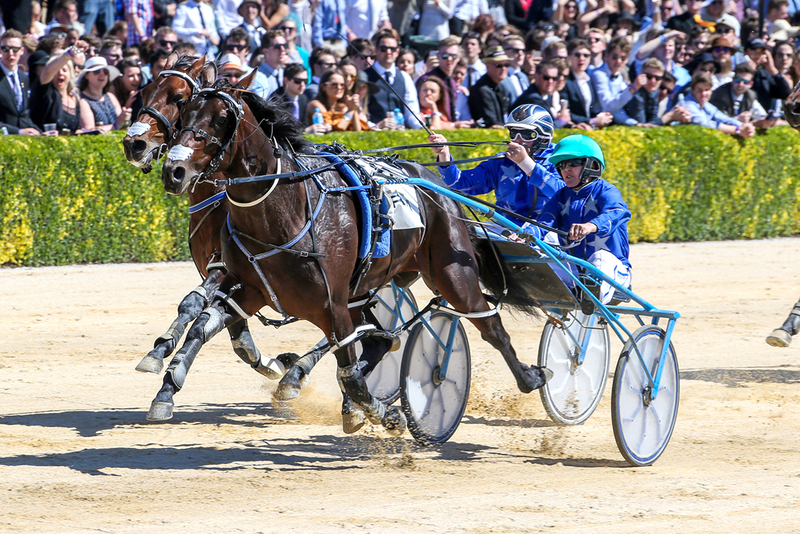 – The NZ Sires Stakes Three-Year-Old Final at Addington on NZ Cup Day – where he announced his arrival as a rising star. His winning performance was nothing short of phenomenal, being caught out wide and just keeping rolling to be far too good in what was a New Zealand record for 1950m at the time. It is regarded as the best ever performance in the history of the race. – Twelve months later, in the NZ Free-For-All on Show Day at the same venue, he did what many thought impossible by sitting outside Tiger Tara before winning the home straight war to claim victory – and in doing so, reclaiming his New Zealand record for the 1950m distance (2:15.7, a 1:51.9 mile rate). – He then ventured to Perth where he monstered the Group One double for four-year-olds in the WA Classic and the WA Golden Nugget – wonderful efforts by the big horse around the tight Gloucester Park circuit and a testimony to his gait. He then ran a close up fourth in the Fremantle Cup before injury curtailed a blitz on the Victorian classics. He’d already done enough to be regarded as a star – but a niggling, leg-injury-enforced retirement surely robbed him of being an open class colossus.